For the hungry explorer who has just completed their expedition to Katanga Canyon, this all you can eat Pizza Pasta Buffet awaits you! Explorers offers guests many freshly made pizzas and pasta dishes, and boasting a huge salad bar and unlimited soft drinks, for one all inclusive price. There is an abundance of seating both indoors and outdoors, and service is generally fast even if there appears to be a big queue at the door. There are no dessert options available, but with Nitrogenie a moment's stroll away in Gloomy Wood, you'll have no problem satisfying your sweet tooth! 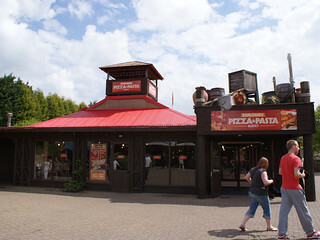 Explorers Pizza and Pasta Buffet opened at Alton Towers Resort in March 2009 and took the place of a joint Pizza Hut and KFC unit.